Luxury consumers in Asia and the emerging markets continue to fuel expansion for the world’s most recognised, gilt-edged status brands. China’s white-hot economy seems to excel in the minting of newly affluent individuals whilst Japan’s brand-conscious luxury seekers continue a decades-old pursuit of “the best.” As a result, luxury retailers such as Cartier, Gucci, Lancôme, Judith Leiber, Sephora,and Tiffany are projected to report higher sales figures in 2014. According to intelligence at “The Economist,” (August 2013) consumers on the Asian continent are likely to account for approximately half of all luxury goods sold over the next ten years as quest for luxury continues. China’s newly affluent luxury consumers are younger than those in the United States and European Union. 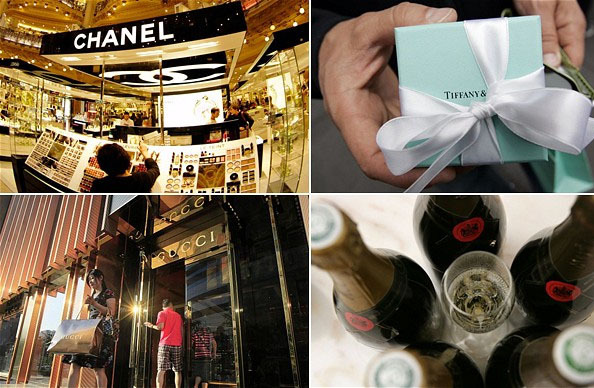 These buyers may have many more years ahead to acquire the luxury goods they desire. Retail analysts say that approximately 80 percent of China’s luxury buyers are less than 45 years old. In comparison, only 20 percent of Japan’s ultra-consumers and 30 percent of U.S. luxury buyers in this age group. Singapore is one of the beneficiaries of robust luxury spending. Visitors from mainland China and elsewhere make Singapore the world’s eighth largest luxury destination, according to BBDO/Proximity. The number of high net worth individuals (HNWI) continues to grow in Vietnam, Thailand, and Indonesia. Julius Baer Bank predicts the number of HNWI individuals will triple in these markets by 2015. The fastest growing HNWI populations are found in Hanoi, Bangkok, and Jakarta. Trendwatching.com identifies many of the newly affluent consumers in search of luxury goods as “citysumers” who are space-strapped. These consumers want luxury goods that make the most of cramped city spaces. They want luxury that instantly telegraphs worth to others. Luxury-demanding consumers choosing vertical “micro-cities” such as Peruri 88 (Jakarta, Indonesia) want each piece of personal and environmental decor (including ultra-slim, compact, and built-in appliances) to reflect an upscale, ultra-luxurious lifestyle. Price is no object to these consumers. Not all familiar U.S. and European luxury brands have met with buyer enthusiasm in Asia and the emerging markets. For example, analyst consensus concludes that leather goods companies like Michael Kors or Coach have not yet acquired the necessary cache’ with Asian and emerging markets luxury buyers. These buyers firmly prefer Chanel and Louis Vuitton, and pay handsomely for perceived quality and brand recognition. However, the greatest upside growth potential exists for those brands that have yet to catch fire. More than 300 secondhand stores (e.g. Milan Station and Chic Stash) opened in China in 2013, in regional second-tier population centers like Changsha, Chengdu, and Hangzhou. According to Fortune Character Institute (October 2013), these outlets sold almost CNY 3 bn (about USD 5 billion) last year. Importantly, this redistribution and resales of luxury items through these conduits supports the luxury sales growth outlook in Asia and emerging markets over the short and long-term. Analyst consensus says that sales of global luxury goods will grow about ten percent (with projected earnings per share growth of 14.3 percent) in 2014. Fine jewellery and accessories growth is projected to benefit from lower precious metals prices. Despite much discussion of slowing Asian growth, customer demand in Asia and emerging markets continues to represent exceptional investment opportunities this year.